If I told you that my waffle maker manipulated my mood, what would you think? What about a blender? Would that change your response? To me, it seems beyond insane that an object would be able to dictate my mood, but that is exactly what the scale did. It is just some plastic and glass, maybe a couple of springs, but it had the power to cause me strong and rapid mood swings. Rejecting diet mentality is the first principle of intuitive eating and rightfully so. We are constantly inundated with dieting in our western society, so one of the steps to getting rid of the diet mentality is to get rid of the dieter’s tools. Yup, that means the scale! I was introduced to IE in June 2015 and it took me damn near a year to give up the scale. I would not weigh for several days and then give in. I’d feel so guilty, like a failure! I had to constantly remind myself to show self-compassion. I had spurts of motivation to give it up along the way, but I always went back to it because I wasn’t mentally ready. I found comfort in weighing myself because it made me feel in control.1 The scale was my friend when the number went down. I was elated and felt of proud and a sense of accomplishment. The scale was my foe when the number was up. I felt dejected and ashamed. I finally gave up the scale when I was in the process of moving in May 2016. My realtor made my husband and me put away all unnecessary objects for our open house and other prospective buyer visits. This meant that the scale had to be kept away. Sure, I could take it out and hide it every day, but selling a house was so stressful that taking that extra step took so much effort that I just decided that it was easier to keep it hidden. After having the scale put away for weeks, I realized that I had not mentally or physically fallen apart without knowing my weight. I decided that I was on a good path and stayed off the scale. One thing I found was that I was actually more intuitive when I ditched the scale. I came to the realization that I had given myself permission to eat as a reward when I had lost weight, and I chastised myself and made myself eat less when I gained weight. That is not intuitive at all! The number on the scale is an external guide. When I got rid of it, I had to rely on my internal cues and that is intuitive eating. Now I have a confession to make. I actually got on the scale a few days ago. As usual, I got out of bed to start my day and the scale peeked out at me from its hiding place in the closet.2 I thought to myself, “I’m just curious about my weight. It’s not obsessive. I’ll be fine!” I have a digital scale, so I had two choices: 1) I could tap it with my foot and step on it only for my weight or 2) I could go to the programmed portion and have it spew out more specific information like weight, body fat percentage, and bone density.3 I decided to go with #2. Why not? I was on the scale anyway. I tapped the scale and told it to give me the data mother lode. I obediently stepped on the scale when it instructed me to. Right before the digital display started showing me my data, I looked up at the ceiling. What am I doing? How will this help me? If I got dressed a few minutes later, my clothes would hug my body the same way whether or not I knew those numbers. My character and the fact that I’m a good person would remain the same. I stepped off the scale. Without looking at the digital display, I picked it up and put it right back in the closet. I knew only bad would have come from finding out the numbers, and sitting with my curiosity was less uncomfortable than the inevitable mood swing that would have happened by knowing those numbers. If the number was down, I would cheer and give myself permission to eat more. If it was up, I’d berate myself and eat less. The scale, an inanimate object, would be telling me what is best for my body. I reject this! My body is smarter than a scale, and listening to my body is what is best for my mental and physical well-being. Though the scale can appear to be helpful, it can easily become an obsession. It’s like anxiety. Anxiety is a natural emotion. It can even be useful at times, like making you slightly more alert during a high-stakes test. It’s when it disrupts your day-to-day life that it becomes an issue. The scale is the same way. The scale is just an object like anxiety is just an emotion. It’s the overpowering fixation with the scale that causes problems. If you are one who has an obsession with the scale, I encourage you to consider giving up weighing yourself.4 It may take time to give up the scale, and you may weigh yourself again at some point along the way. That’s okay. The scale is a temptress. Just reflect on how you feel before, during, and after, and take it as a learning experience. I could go on and on about how I feel more at peace with my weight now, but it’s more powerful when you realize this on your own. When this time comes, make a mental note and put a bunch of stars or happy faces or fireworks beside it so you can remind yourself of this experience in the future when the scale and diet mentality tries to lure you back in. Please share your experiences with the scale in the comment section below! 1The cruel irony being that the scale was actually controlling me! 2Yes, the scale is in the closet. For the most part, it’s out-of-sight-out-of-mind. I really should beat it with a baseball bat Office-Space-style, but my husband still uses it. 3Those are a lot of numbers to obsess over! I wrote about this in “Numbers, Numbers Everywhere”. 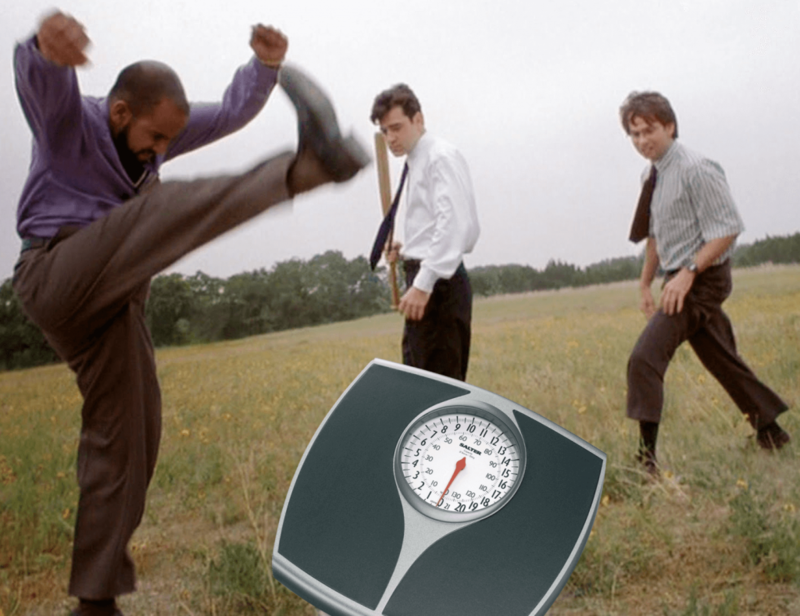 4I share my thoughts on whether or not having your weight taken by a doctor is necessary in “Refusing the Scale at the Doctor’s Office”. Who Says I Can’t Eat Dinner at 4pm? I very much enjoyed reading how you conquered your scale use. I consider the scale an instrument of self torture as well as a tool of dieting – which is so NOT helpful for my (or ANY) body. Getting over needing to appease a ‘number’ is a major step in ditching diet mentality and freeing one’s self. Bravo for you! And thanks for sharing this inspiring blog. Thanks! I am so happy that you find my writings inspiring! If your baby step is to have your daughter take down your weight, then that’s fine. Everyone’s journey is different, so if that is what it takes for you to move closer to giving up the scale, then do it. Do what works for you. You’ll be able to give up the scale at some point. You’ll know when that time comes for you.